Post here for commentary/corrections/etc for the assembly manual for the Rostock MAX v2. Make sure you're using the most current manual! Head over to http://seemecnc.com/pages/downloads to download it! Re: Assembly manual discussion thread! When searching images.google.com for "ton", you'll find some very odd, very disturbing things. Some times I really don't want to internet any more. geneb wrote: When searching images.google.com for "ton", you'll find some very odd, very disturbing things. Some times I really don't want to internet any more. It is a new design. The sides have been shaved a bit, the PEEK barrel has had improvements made (single liner now!). Also, you don't need to use foil on the resistors. Steve & the guys at SeeMeCNC have been testing using RTV only and they haven't had one fail yet. I suspect it's because the copper in the RTV is helping the heat distribution quite a bit. The portion I posted last night is just to give you guys an idea of what's coming. The new effector platform is insanely great. No more sanding at either end of the delta arms! You'll still want to spend a little time removing flashing from the injection molding process, but that's the extent of it. The images used in the manual have been pushed to github so you can see the larger versions of any of them if you're interested. I'll be starting on the actual assembly process this evening when I get home from work. There's also some "prefix" stuff I need to get added in. Doctor appts fill most of Wednesday, so that may be a slow writing day for me, but I don't see any reason why I can't hit the Friday due date that John snuck in on me. I missed installing some screws, so I get to tear the base apart in order to install them. You'll notice one or two "odd" photos - those will be from Andy's prototype build. When I miss a step like this, I'll use his photo as a reference so I don't have to do a TOTAL teardown. The good news is that because of the lower part count, there's not so many tabs to align so taking the top off the base and re-fitting it isn't nearly the painful experience it once was. For the curious, you can view Andy's prototype build photos here: http://www.flickr.com/photos/seemecnc/ - this is what I'm using to write the manual. I'm using my own photos for the most part and my assembly order will be a bit different than his. 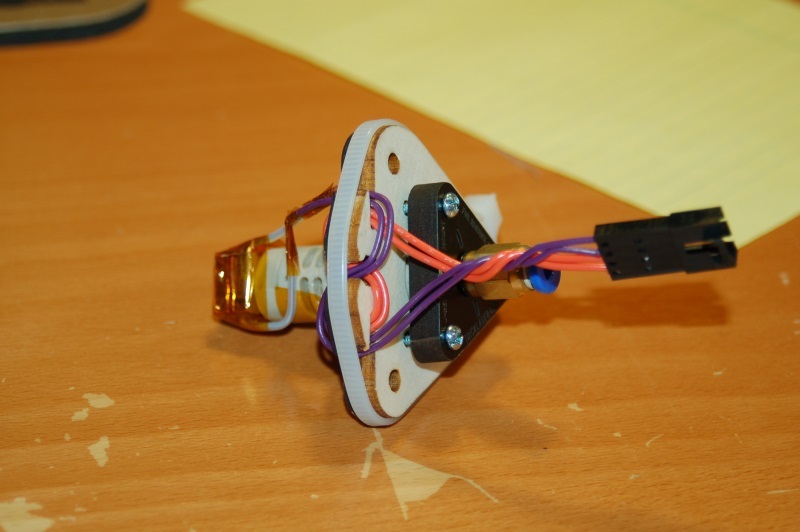 The hot end wiring will use four pin connectors like the one I used in the image below, and I'll use JST connectors for the fans. Using the connectors allow folks to change things out more easily and that's a bonus when you guys like changing to different hot ends so often. The four pin and JST connector sets can be purchased from Hansen Hobbies (http://www.hansenhobbies.com/products/connectors/) VERY inexpensively. I feel the pictures of the screws should be larger, you can't tell if the screws apart in your pictures. People who are new to assembling printers won't be able to visually tell the difference between the two screws. Seeing that this version of the Rostock Max focuses on ease of assembly, it is not a bad request. AFAIK, they've been shipping the hot end itself for a while. You'd have to email them to know for sure though. Your assembly guide is awesome thanks. I started my kit using the 2nd edition guide and got to the effector. The effector I got looked completely different than the effector in the guide. I noticed the v2 guide you are working on and that has a picture of my effector It lookes like i have a sort of hybrid: v1 cheapskate U-joint mount and V2 effector. 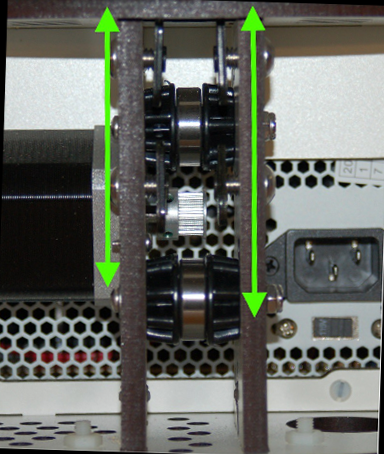 I can not think of how to use the clips on the effector and get free rotating U-joints. Please give me a little hint. When I get to that point in the build, I will! Doctor appts are eating my time today. I pushed a new release of the v2 manual last night - there's enough there to show you guys how easy it is to build the base. geneb wrote: I pushed a new release of the v2 manual last night - there's enough there to show you guys how easy it is to build the base. Bingo, that update and the detail involved in the build manual was enough to push me over the edge to pull the trigger and order a V2! Can't wait to get building! Rotated "Fig. 6-11: T-Slot nut plate orientation." a little bit. 118 pages into it so far. One thing I've noticed is that the wires are always going through the holes for the hot end. It is probably me but I never do that - primarily since if I have a blow out, it's easier to rewire a specific part - like a thermistor when it's outside of the holes. I'm pretty sure that is not likely to change but I thought I would mention it. We all have our own little best practices. Regarding foil on heating resistors, I never used it. The RTV really does work just fine. The new hot end adapter is designed such that you don't run the wires through those holes any longer. I'll be using Andy's photos for the hot end build and "hard wired" install, and my photos & process for using a 4 pin LP connector and two JST connectors for the hot end and fans. I got hooked on those 4 pin connectors from my LulzBot. They're perfect for doing quick-change hot-ends. Caught this on my last build: On page 158 of the V1 manual, a typo - axes - should be axises? 2. Using Kapton tape before and then right after soldering down the leads on the heated bed helps things. Squeezing a little bit of RTV after creates a protective surface around it. 3. I also use painters tape around the head before the RTV, and then use a razor knife to trim the excess off, then just peel the tape back. Helps keep things pretty. Gene is in the middle of writing the documentation for the V2 and adding more to the Orion docs. Perhaps he can add your request to his long term planning, but he is under enough stress right now. The plural of "axis" is "axes". The bad prints thing is a good idea, but it's more of a wiki thing than an assembly manual thing. If you want to make a quick-change hot end, you only need to buy one connector as the RAMBo parts baggie has extra four pin female connectors and pins in it. What's the difference? It's especially confusing when, to install the stepper motor drive gear, you need "blue thread locking compound." aaaand that's why it's called a Work In Progress. They're both describing the same thing Dan. Blue Loctite or Permatex Blue Thread Locker is what you want. geneb wrote: The plural of "axis" is "axes". And eternally sorry for the typo thing. That's probably why I didn't vote for Bush or Chaney. geneb wrote: aaaand that's why it's called a Work In Progress. Well, yeah! I'm always happy to point out problems, but please know that we all appreciate your work and the fact that you're willing to put it out there, unfinished, for people to shoot at. The final results will be great. geneb wrote: They're both describing the same thing Dan. Blue Loctite or Permatex Blue Thread Locker is what you want.